"To some outsiders, it looks firmly stuck in the 1950s. Vintage cars roam the streets, the landscape is absent of strip malls and global chains, and the buildings -- though crumbling -- hark back to a grander time. 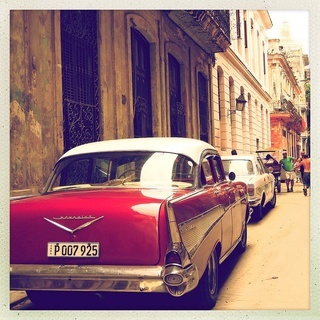 It is these throwbacks that lend Havana, the country's capital, an undeniable charm. A charm that, some worry, is in peril once the U.S. embargo lifts." I've been to Cuba. My wife's family emigrated from Cuba to the U.S. before she was born, but the State Department issues waivers to Americans to visit family who remained. We went in 2011 with my in-laws. We stayed in her aunt and uncle's one bedroom apartment, the six of us. We got our food from the ration store. We stood in line waiting to be able to buy bread. There's nothing romantic about the abject poverty that comes from a despotic government that stymies its own citizens' ability to advance their own well being. But as a white tourist in Cuba, I was also able to access the tourist side of Havana. It's a carefully constructed façade designed by the Cuban government to attract rich white tourists who want to photograph the derelict infrastructure before going back to their refurbished hotels with modern luxuries. When the Soviet Union collapsed, the Cuban government found itself woefully short on foreign cash reserves to import basic life necessities onto the island. Tourism was their only export, and they made sure to build a tourist experience segregated from the realities of daily Cuban life to ensure that their foreign visitors' vacations were never tarnished by the cruel realities of life in a dictatorship. Imagine DisneyWorld, except behind the scenes they impoverish, terrorize, imprison, and execute the employees and their families. This apartheid of tourists and residents was mostly engineered with currency. Up until 2013, the local Cuban peso was not an exchangeable currency. You couldn't buy them with euros, yen, or dollars. But they were the only currency Cuban citizens can use. For tourists, the government created an entirely alternate and exchangeable currency known as the "cuc" (pronounced like kook). The hotels took cuc, not pesos. The restaurants took cuc, not pesos. They even had separate taxi cabs depending on whether you're paying with cuc or pesos. By limiting who could accept cuc as payment and by controlling where such establishments were operated, the Cuban government carved out entire sections of cities and of the country for the tourists. This 1950's vintage feel that CNN fears will go away is a carefully constructed government illusion. It's as much Cuba as the NYNY Hotel in Las Vegas is the Big Apple. It's absurd to lament the death of this system. It's cruel to prefer the Cubans live in abject poverty. It's self-serving to try to preserve a system where the finest parts of their culture and the finest products of their country are reserved for the tourists. Slum tourism isn't romantic. America's greatest potential export to Cuba would be investment capital and entrepreneurship. I can't wait to see what happens when the powderkeg of Cuban initiative and ingenuity is unleashed.